I have experienced “rapture on the lonely shore” and have partaken of the healing solace found “in pathless woods.” I know now, on a deeper level, that polish comes through trouble and that not a single heartbreak in one’s lifetime need go to waste. All things can be used of God to develop in a believer an unshakeable trust in Him. He is the Rock of Ages and I am confident that He holds me tight in the place cleft especially for me. THE RADIO: WILD LIFE! WILD PLACES! Six sea turtles were returned to the ocean off Topsail Island, North Carolina, this morning after having been healed of illness or injury by the staff and volunteers of the Karen Beasley Sea Turtle Rescue and Rehabilitation Center. 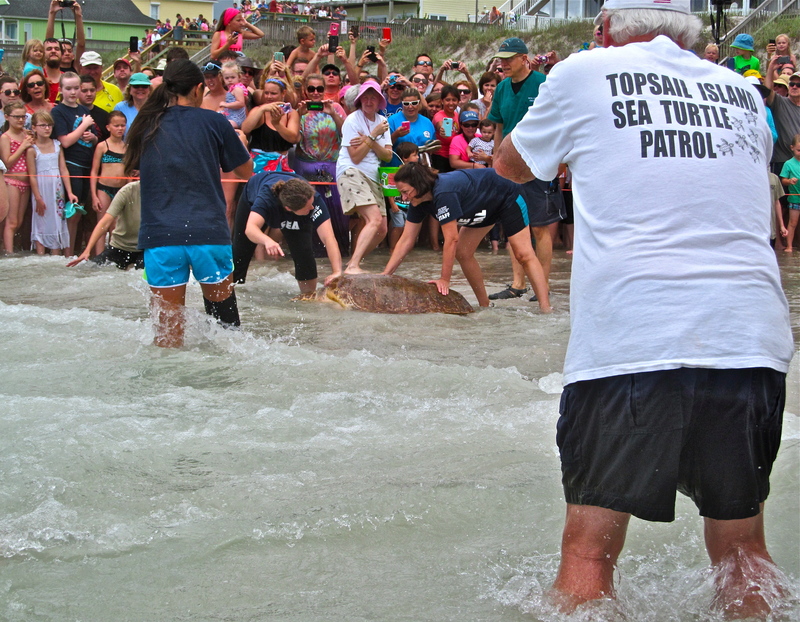 One by one, in slings or in the arms of caregivers, Camper, Coldie, October, River, Simon and Theodore were carried to the water as hundreds of turtle lovers and onlookers erupted in applause and cheers. Joy is found in abundance at these releases and you can sense the excitement in the turtles, in the caregivers and in the onlookers! It’s the culmination of lots of love and lots of rehab. Wonderful! The idea for the center originated with Karen Beasley, who died from leukemia in 1991 at age 29. 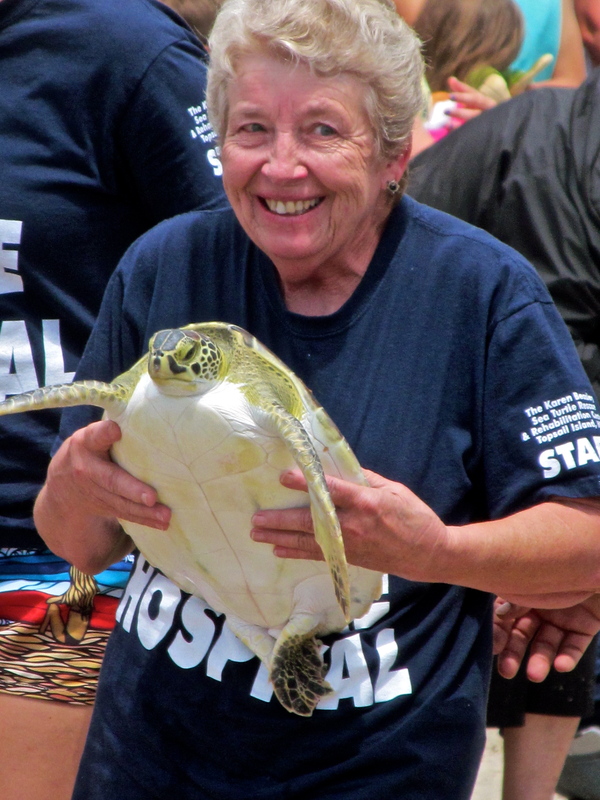 As her health was declining, she specified to her mother, Jean, that her insurance funds be used “to do something good for sea turtles.” Together, they began to organize their sea turtle protection efforts into the Topsail Turtle Project, writing a mission statement, structuring the beach monitoring program, and recruiting volunteers. The dream became reality in 1997 when the first sick and injured turtles were rescued and rehabilitated. The center was housed in a 900 square-foot building until June of 2014, when home became a new 13,600 square-foot, $1.5 million facility. 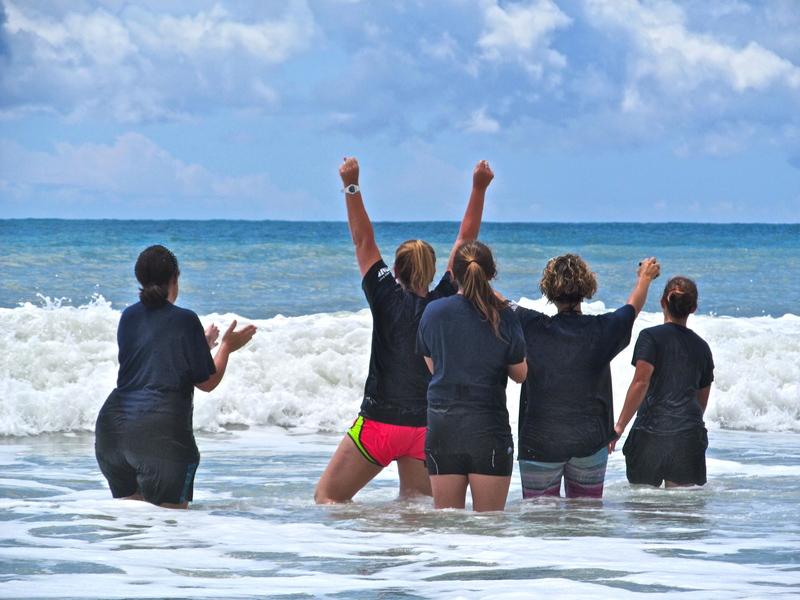 The center has rehabilitated and released more than 300 turtles since 1997. Providing an experiential learning site for students of biology, wildlife conservation and/or veterinary medicine from around the world. The center, which is located at 302 Tortuga Lane in Surf City, will open for daily tours starting June 8, from noon to 4 p.m.
All photos by D.F.G. Hailson. “Great for Kids and Pets”?